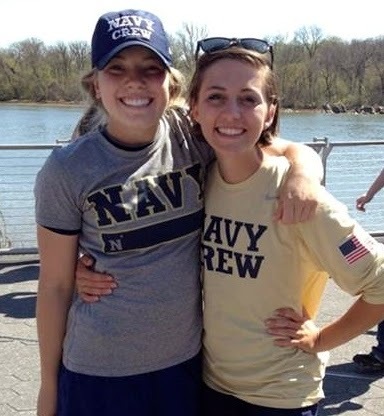 Plebe Year at the Naval Academy - emma and co.
Back in the sophomore days of school, I met Olivia, someone with whom, despite moving across the country and going to rival high schools, I have managed to stay close. It's funny because every time she calls me while she's at school, I always drop everything to take the call because I feel like she's calling me from jail where she only gets one phone call- hahaha. From walking around Georgetown after crew practice to road tripping in Southern California, we have definitely stayed in touch through the most distancing circumstances. Back in 2011, I remember talking to her about starting a blog, but never got around to it, so I figured it only fitting to have her post on her experiences- this girl is amazing. This regimented schedule is a little different than the typical college schedule, but this is what I signed up for when I applied to the United States Naval Academy. I am Midshipman 4th Class Czerewko and I am one of the 4,500 students that attend this 4-year military college in Annapolis, Maryland. However, to Emma I am simply Olivia. We have survived 3 years of high school, 1 cross-country move from Virginia to California, and our first year of college. While our imagined dream of rowing together at Georgetown University did not pan out, we have made choices that brought us to where we are today. I applaud her achievements both academically and athletically, as well as the never-ending advice we share in our late-night phone calls from the corner of the library. I could write pages about the Academy and the classes I am taking, and the rowing team, but that is not something we can all relate to. We do not all walk the same footsteps. But we do all experience some form of heartbreaking love, raging anger, drops of tears from our sadness; these emotions are present in criminals and lawyers, in priests and waitresses, in you and me. As I started “Plebe Summer,” the summer boot camp at the Academy, all I could think about was a comment I had received a few weeks beforehand; this person told me I was too prissy to attend the United States Naval Academy. I tried to push it from my mind, but, like many criticisms, I started believe in this woman’s words. This insecurity was further highlighted over the summer when the training staff brought up my valley girl accent and high feminine voice. It seemed they never noticed how many push-ups I could do, or how fast I recited daily rates; to them, I was the weak link with my feminine voice in a military setting. It was then I decided to become a cold-faced killer and try to change their minds. I was wrong. It took me the entire year to understand that my voice defines me. Consistency is the key to the door called life. We all doubt ourselves from time to time, but our personality sticks with us for life. Yes, we can grow, we can be a lover and a hater. You all must be familiar with the saying “practice makes perfect.” Well, when you “practice” your own personality, you find out what parts work with people, what parts handle stress, what you like and dislike. We use our strengths to overcome adversity and give everything we can towards a perfect outcome. I am so much more comfortable with myself now than I have been in the last year, but I am still learning how to handle this military setting. But now, when someone comments on my femininity (or "excess" of), I apply another coat of mascara, don my camouflage uniform, and proceed to drop down and give them 20. We must remind ourselves to bloom where we are planted, even if it means we have to dig our roots through rocky soil. Thanks so much Olivia! Happy Tuesday!